The name of the drink is enough to make a lesser man nervous. But have no fear; this is a drinking man’s cocktail. The origin and history of this cocktail alone, should place it in the same company as the other bourbon based cocktail mainstays, unfortunately this red-headed step child of a drink has been relegated to second class status, known only in small but distinguished drinking circles. Much like our third president, this drink is all American but very much at home in Paris. 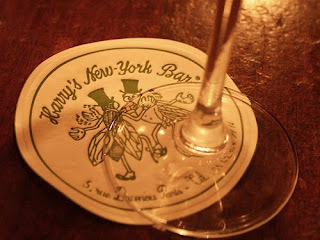 Harry McElhone, had been the bartender at the Plaza Hotel in New York prior to prohibition. Once Volstead’s law was passed he headed overseas to ply his trade. After a stint in London, he headed to France, eventually opening his own place. Harry’s New York Bar, maybe you’ve heard of it. The Boulevardier, first appeared in Harry’s 1927 bar guide, Barflies and Cocktails. Similar to it’s cousin the Negroni, this concoction starts with Campari and sweet vermouth. The gin is replaced by bourbon. I like this drink on the rocks, but it can easily be shaken and served in a cocktail glass. Start with an ounce and a half of good bourbon, I like Gentleman Jack or a nice smooth small batch bourbon. Add an ounce of Campari and an ounce of sweet vermouth. This drink has the confidence to stand on it’s own, without the need for a garnish. This drink should be mixed, served and consumed with an extra air of panache. Build this drink in an old fashioned glass full of ice.